Are you ready to bring in the New Year? What do you have planned? When we were in Mexico for New Year a couple of years ago, we loved all their bringing-in-the-new-year traditions and have definitely adopted one...even if we are making a little change to it this year! The idea is that when making a toast with champagne for the New Year, each person should have 12 grapes, one for each month of the new year, in order to attract good vibes throughout the coming year. With each strike of the clock on the final seconds of the year, you have to eat a grape - one on each strike, with the wish that your hopes and dreams will come true. 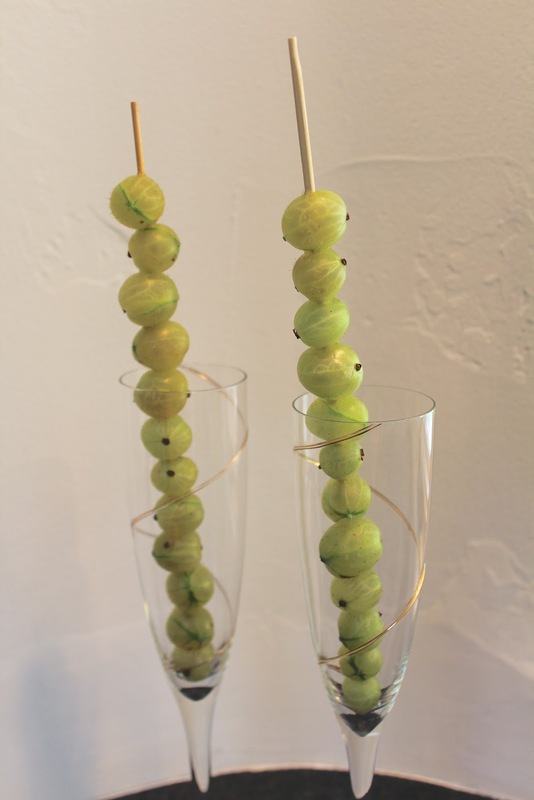 The grapes can be little bunches for each person, but we liked the idea of putting them on a skewer and in the champagne. 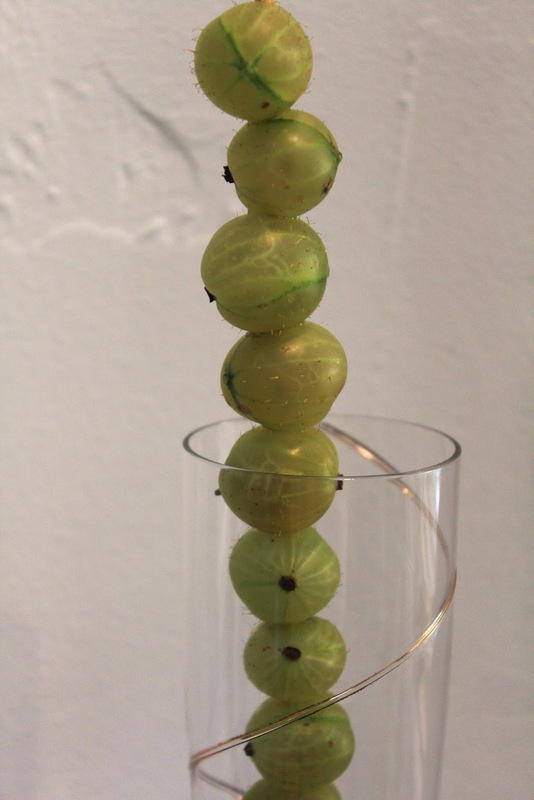 Our slight deviation this year, however, is that the other day I found some gooseberries for sale in Sonoma! I absolutely adore gooseberries and have only seen them on sale once before in the US! So I bought all they had and so we have our skewered gooseberries to bring in the new year, instead of skewered grapes! Don't they look good!...and will look even better when the glasses are filled with champagne. underwear! The underwear you wear on the last night of the year must be new and given to you by someone else! The color should be red to attract love and passion, and yellow to attract money and success. When we were in Mexico, we saw quite a bit of red AND yellow underwear for sale just before new year - so you can attract it all!!! suitcases. If you want to travel in the New Year, you should keep a couple of suitcases ready at the door of your house, stuffed with clothing. In the first few minutes of the new year, take them out of your house and walk them as far as you can, to attract lots of trips in the new year. lentils. Eat at least a tablespoon of lentils to attract wealth and prosperity in every way, and especially for a business. broom. As the new year strikes, open the door and use a broom to sweep out the bad vibes and welcome the good vibes in. coins. Have a lot of coins and money on hand that you can count when the clock strikes midnight, which will bring you a lot of wealth. Some place it in their shoe to bring more prosperity! So what are you wishing for in the New Year? Do you need to send someone out quickly to buy you new underwear? Whatever your hopes and dreams, enjoy making them come true. Have fun bringing in the New Year and may 2013 be full of happiness, love, and good health. PS. Not sure how the gooseberries will go with the champagne, to be honest!